29, 30, 31… The numbers flashed rapidly as I watched my stopwatch while timing how long it took to boot into Windows 7 and load the startup programs. 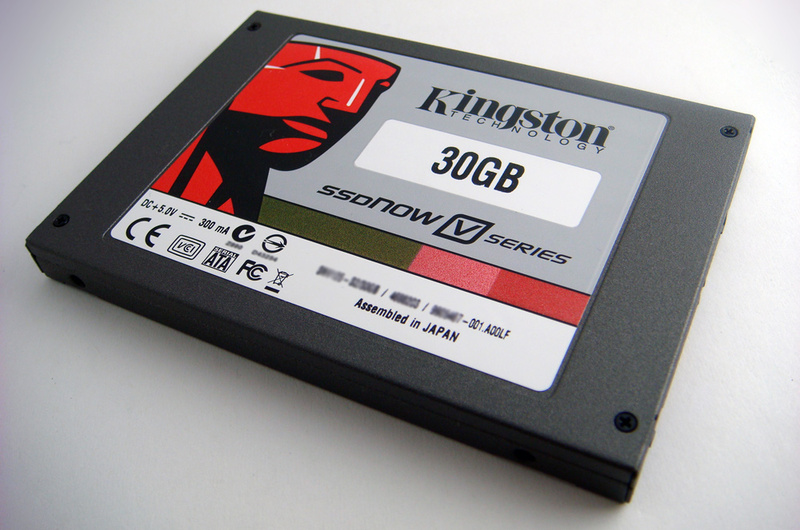 Stopping the clock at 32.5 seconds, Kingston’s 30GB, SSDNow V-Series, solid state drive performed impressively. Within the past year, Kingston has successfully brought to market affordable solid state drives (SSDs), which easily blow away traditional hard disk drives (HDD). Kingston’s SSDNow V-Series has become a very popular choice for consumers interested SSDs without wanting to pay a fortune. Let’s see how mean of a punch Kingston’s budget SSD packs. Solid state drives are a fairly new technology and are quickly becoming favorites among enthusiasts and productivity users. SSDs differ from traditional HDDs in that they have no moving parts. There are no platters that spin around and no heads that need to seek the data. The primary benefits of an SSD are fast read speeds, incredibly low access times, and low power consumption. I’m sure you’ve noticed that when you open a program such as Microsoft Word or a computer game it takes a noticeable amount of time to load. That wait time is severely reduced since SSDs can access the data in under a millisecond. Although they easily outperform HDDs, SSDs do have their drawbacks. The lifetime of an SSD is significantly shorter than a standard HDD and performance will begin to degrade after a few years. Another downfall is that SSDs are limited in the number of write operations (saving a document, or installing a program) that you can make to the drive. Finally, SSDs are significantly more expensive than HDDs. Until this past February, you would get around .2GB to .33GB per dollar compared to about 15GB per dollar with a HDD. Fortunately, now we’re seeing more for your money at around .5GB per dollar. 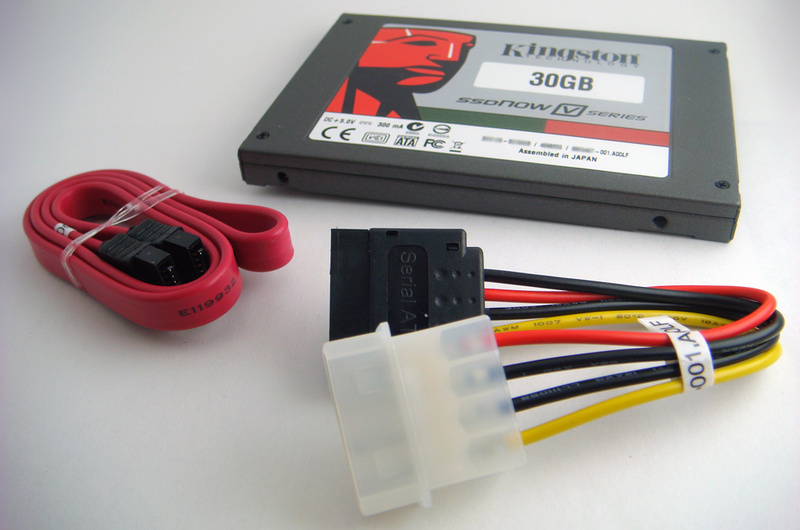 The Kingston V-series 30GB “desktop upgrade kit” includes an installation CD, molex to SATA power adapter, SATA cable, 3.5 inch bay adapter kit, and the SSD itself. The installation CD contains a .PDF user manual as well as the superb Acronis disk imaging software. This CD is especially important if you want to move your current boot drive data over to the SSD. The SSD itself comes in the standard 2.5- inch format. I’m very glad Kingston decided to include 3.5-inch bay adapter rails since most SSDs don’t; they usually cost an additional $10 or more. Physically installing the SSD is more complicated than a standard HDD. I had to use the included 3.5-inch bay adapter rails since my computer case, like most, doesn’t natively support 2.5-inch devices. Print out the .PDF instructions because you’ll need it to know how to install the SSD while your computer is off. Once you’ve physically installed the SSD, you can proceed in a few ways. If you’re planning on making the Kingston V-Series 30GB your main boot drive, you can use the Acronis software on the user disk to clone your old boot drive to the SSD. To do this just insert the bootable CD and restart your computer. Once you boot from the CDROM, the Acronis software will guide you through formatting and cloning your old data to the new SSD. If your boot drive now has 50GB of info on it, you’ll either need to compress the data or remove some of it, because you can’t clone more information than the SSD can hold. If you don’t plan on using the Kingston V-Series 30GB as your boot drive, you can use also use Acronis, or your Windows install disk, to format it so that Windows will recognize it as a secondary drive. 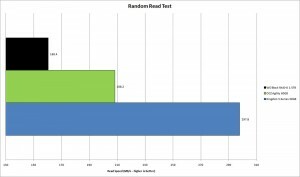 To test the Kingson V-Series 30GB SSD I ran various benchmarks. I used Crystalmark, HD Tune, Everest Ultimate Edition, and Sandra to measure the read and write speeds of this drive. For fun, I also decided to see how long it would take to boot up into Windows 7 Professional on the two SSDs. The Kingston V-Series 30GB’s competition was a 60GB OCZ Agility SSD, as well as a Western Digital Caviar “Black” 1.5TB RAID-0 array, which consists of two drives that act as one large drive with double the read and write speeds. CrystalMark is probably the easiest hard drive testing benchmark to use due to its simple layout and clear tests. 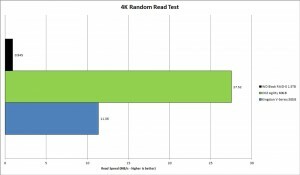 I ran the entire suite of tests consisting of a sequential read/write test, 512k random read/write, and 4k random read/write. The test sizes were limited to 100MB and each test was run 5 times. 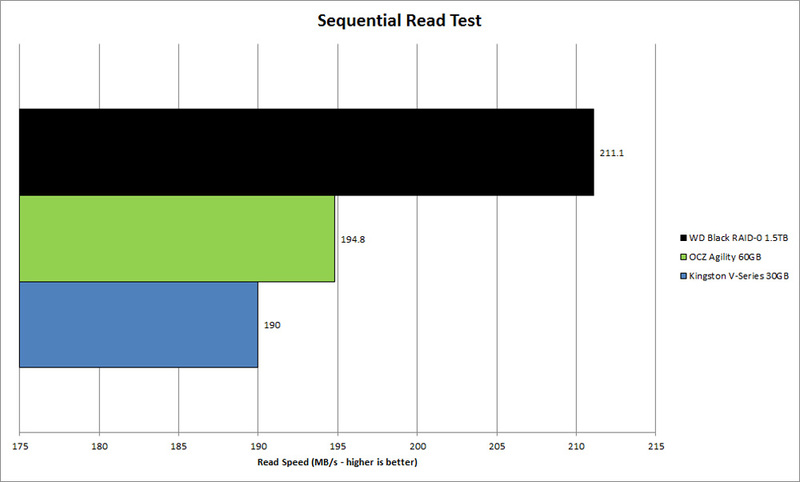 Our V-series 30GB SSD came up last in CrystalMark’s sequential read and write tests, but this isn’t too bad. 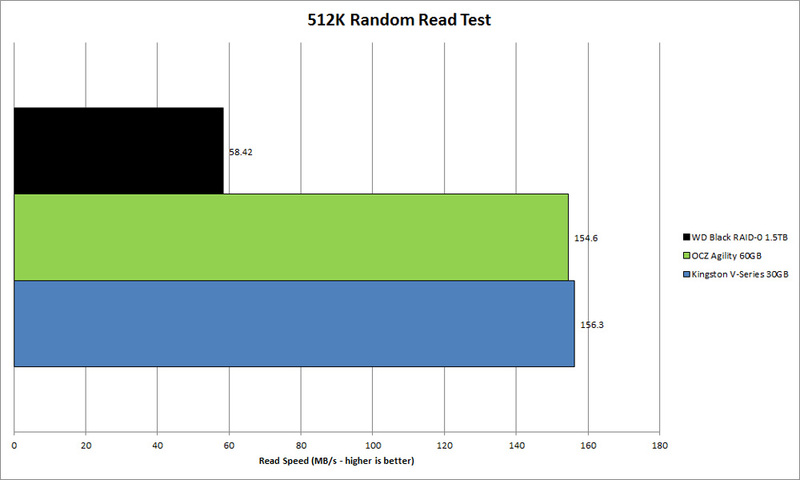 The V-Series SSD is still 44% faster in read operations over a single WD Black drive. 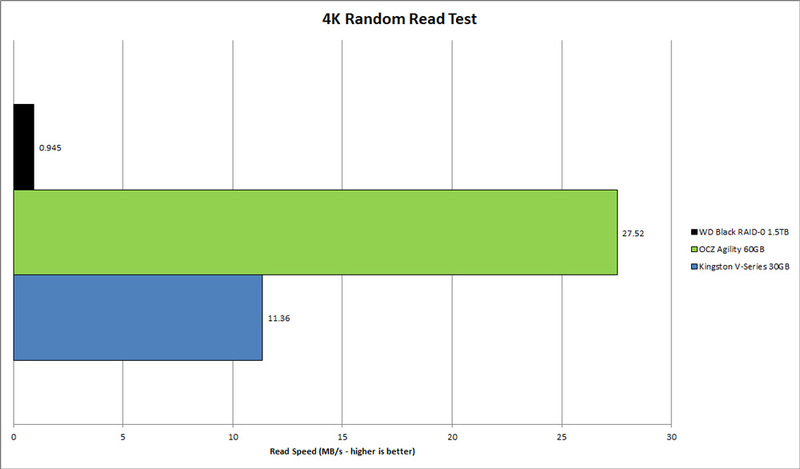 Compared to our OCZ drive, the Kingston SSD was only 2.5% slower in reading, which is hardly significant. On the writing side of things the V-Series 30GB could have done a bit better. Both the OCZ Agility and WD RAID-0 array were more than 60% faster and left the V-Series 30GB in the dust. Fortunately, high write speeds aren’t as important as read speeds, but don’t plan on quickly copying files/installing programs on this drive. Here’s where I got to see the V-Series 30GB shine. 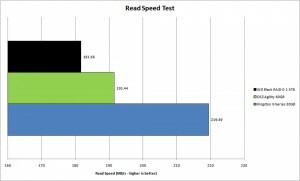 The Kingston and OCZ SSDs obliterated the RAID-0 array by over 60% in read speeds. This huge performance gap of each single SSD beating two HDDs is largely thanks to low access times. Since the RAID-0 array has to jump around the platter looking for data it’s much slower than the SSDs. 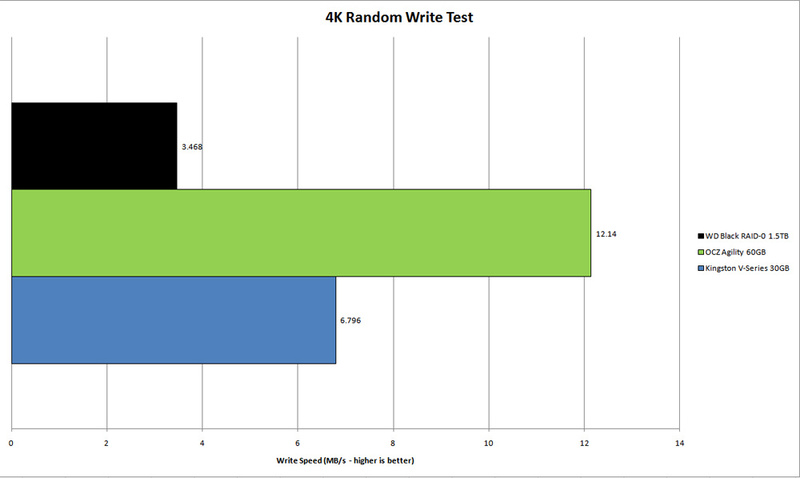 Our V-Series 30GB slightly edged out the OCZ drive by 1.1% in the 512k read tests, but was 58.7% slower in the 4k tests. Writing seemed to be the V-Series 30GB’s only difficulty. Everest Ultimate Edition has a comprehensive suite of hard drive and solid state drive benchmarking tests. We will be using its linear read test, which is the same as a sequential read test, its random read test, and its access time test. Everest’s linear read tests painted a very different picture from CrystalMark’s sequential read tests from earlier. 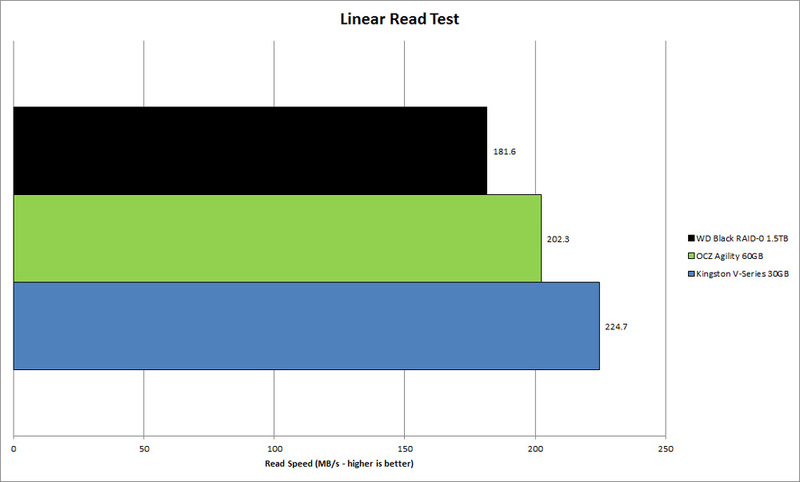 Instead of coming in last, our V-Series 30GB SSD came in first, beating the OCZ Agility by 10% at a whopping 224.7MB/s. The other competitors performed well, but the gap between them and the Kingston SSD was significant. 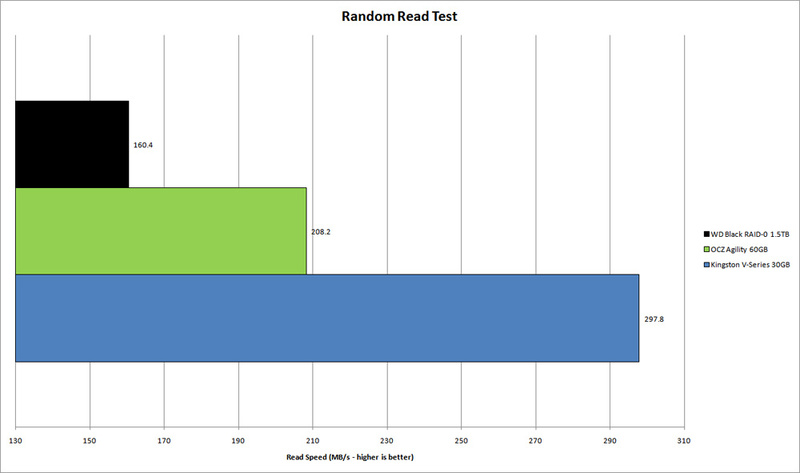 Moving on to the random read tests, I saw the Kingston SSD take the lead once more. 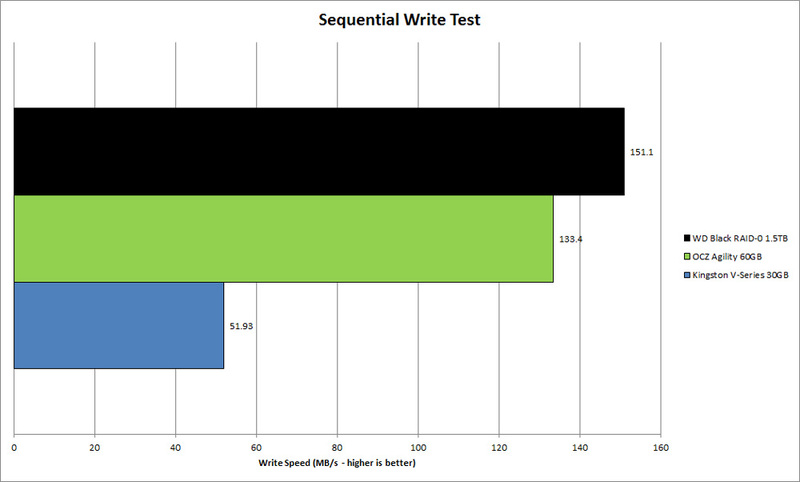 This time, the V-Series 30GB was 30% faster than the OCZ Agility and 46% faster than the RAID-0 array. Here I saw just how large the gap in access times is between SSDs and HDDs. Both the Kingston V-Series 30GB and the OCZ Agility 60GB’s access times ranged in the microseconds while our fast RAID-0 array took 11.37 milliseconds. The Kingston SSD was 98.9% faster than the pair of WD Black HDDs. HD Tune is a popular HDD and SSD utility tool. In addition to benchmarking, HD Tune can also show various information about your storage device such as temperature, good/bad sectors, and longevity. 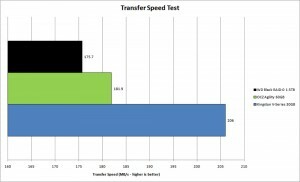 I will be using HD Tune’s transfer speed test (read test) as well as its access time test. Like Everest Ultimate Edition before it, HD Tune praises the Kingston V-Series 30GB’s impressive read speeds. We saw it easily edge out the OCZ and WD RAID-0 array by at least 11% . 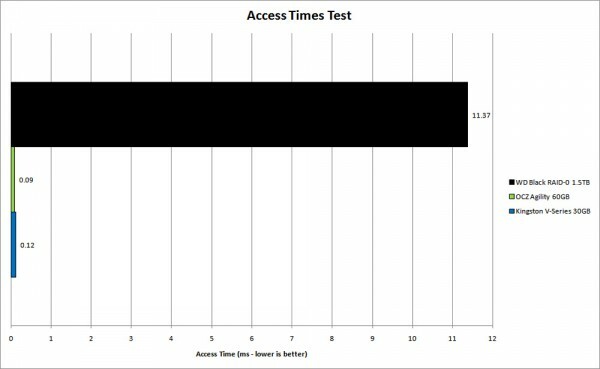 Access times were more of the same as well. The hard drives just can’t hold a candle to the budget SSDs. Sandra has been around a long time and is a popular system diagnosis and benchmarking program. It has comprehensive information about your computer and can also benchmark just about every component. 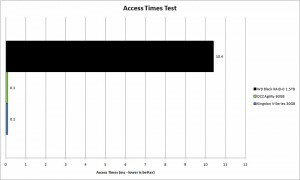 I used Sandra’s read speed and access time tests for our drives. Sandra solidified the Kingston V-Series 30GB SSD as the king of reading in our storage drive lineup. 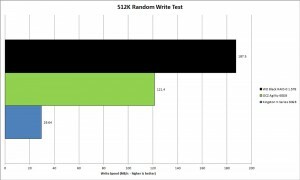 The gap was slightly widened between the Kingston SSD and the OCZ SSD to 12.8% with our struggling WD Black RAID-0 array still in last. Access times once again showed just how much more responsive an SSD is over a HDD. One area where users will definitely notice the benefit of an SSD is during bootup. I wanted to see which one of our SSDs would boot into Windows 7 Professional and load all the startup programs the quickest. Startup programs ranged from NOD32 antivirus to diagnostic utilities such as MSI’s Afterburner GPU tool. 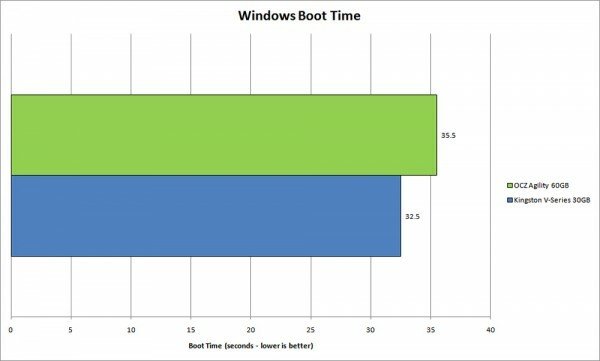 Like the benchmarks before, I saw the Kingston V-Series 30GB SSD boot into Windows slightly faster than our OCZ Agility. Three seconds isn’t a huge amount, but I feel it’s significant enough. The speed at which an SSD can load all of your startup programs is simply phenomenal regardless of the maker. The Kingston SSDNow V-Series 30GB boot drive represents an excellent choice for consumers interested in making the move to an SSD. It’s priced competitively and carries a strong performance. 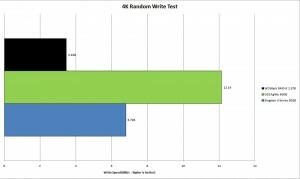 I consistently saw it outperform our WD Black RAID-0 array in read operations and it even edged out our OCZ Agility drive. The V-Series 30GB drive also supports TRIM, which helps maintain longevity of the drive by cleaning up deleted files. Kingston offers this drive in a “desktop upgrade kit,” which is what I reviewed, as well as just the bare drive for users who might want to install this in their laptops. Currently Newegg has the desktop upgrade kit for $74.99 after a $30 MIR and the bare drive for $89.99. In the sub $100 price range the V-Series 30GB is a nobrainer and earns Skatter Tech’s recommendation.